Avid skiers know all the snow condition terminologies—corn snow, powder, packed powder, slush—so they will be prepared for what they are sliding on. The same holds true for those of us who must follow weather forecasts to manage snow plowing or clearing snow off the tops of trucks and trailers. Last week’s Nor’easter was described by those forecasting the approaching storm in many ways, but the term that stuck most in my mind was ‘Guerrilla Glue.’ Meteorologist Frank O’Laughlin used Guerrilla Glue in his forecast to describe a snow consistency that would be heavy and wet. It would cling to trees and electrical lines and probably cause power outages. 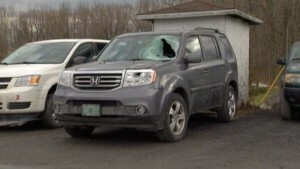 Snow and icy debris flying off trucks, trailers, buses and other vehicles in transit can cause damage and injury. Wet heavy snow can also be a challenge for the transportation industry because it clings to the tops of vehicles. When temperatures drop after it falls, as they did with this storm, the snow can become a crusty, icy, hard-packed mess. This snow, when accumulating quickly, also adds to a trailer’s weight. More importantly, it becomes a safety concern when it is not cleared from trucks, trailers and any passenger vehicle before transit. In the aftermath of this recent heavy snow storm, we saw news stories across the Northeast of vehicles hit by flying snow and icy debris, as well as falling tree limbs which resulted in tragedy. TrucBrush at Pilot Flying J Travel Centers in Sturbridge MA and Milford CT will be available all winter. This type of snow consistency, however, is effectively addressed by TrucBrush, a patented, mobile brush device that quickly clears heavy wet snow from the tops of trucks and trailers. 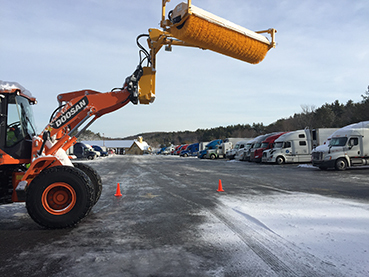 After this February storm, our clients reported that TrucBrush easily cleared the heavy snow from their trucks and trailers. Even trailers which were not scheduled to leave terminals were cleared so that the heavy snow accumulation would not cause damage to the trailers due to excess weight. TrucBrush clears snow in approximately one minute from a tractor-trailer. 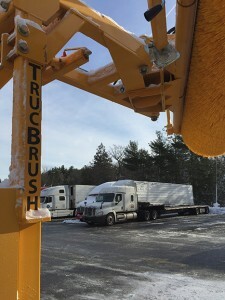 TrucBrush Services were also available in Connecticut and Massachusetts at Pilot Flying J Travel Centers #255 and #222 where truck drivers took advantage of having a quick, safe and effective means to remove the accumulated heavy snow from their trailers. (Services at these two Pilot locations will continue to be available all this winter.) Truckers took advantage of the service to eliminate the potential for flying snow debris in transit and in some cases to also avoid being over the limit prior to weighing in on the CAT Scale. As with skiers who get the most out of their runs by being prepared, these dedicated truck drivers knew the type of snow they were dealing with and they were able to easily address it with TrucBrush. For more information on TrucBrush, email info@TrucBrush.com.